Rubinia steal-your-stuff deck. Plus ETB shenanigans. Deck centers around stealing creatures and sacrificing them, or otherwise flickering them to maintain permanent control of them. We have some sac outlets in Ashnod's Altar , Spawning Pit , Evolutionary Leap , and Greater Good to take opponents' creatures and just dispose of them. Proteus Staff also lets us remove creatures (and even can permanently disable a commander) and has the bonus of letting us grab a random creature off our deck! We can also maintain control of opponents' creatures and still untap Rubinia with Conjurer's Closet , Restoration Angel , Nephalia Smuggler , and Deadeye Navigator . With a single repeatable sac outlet out, Thornbite Staff allows Rubinia to steal and sacrifice every single one of the opponents' creatures all at once. And Isochron Scepter is here to combo with Dramatic Reversal for infinite mana with a couple manarocks. Either Great Whale or Peregrine Drake can also combo with Deadeye Navigator for infinite mana. All of the infinite mana combos can be used just for utility, or can power a Blue Sun's Zenith to off a player, or Martial Coup for an army of near-infinite 1/1's. Beguiler of Wills actually works great with Rubinia. 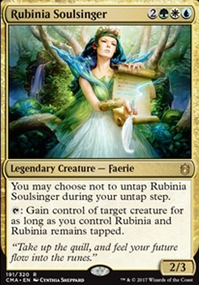 If we've only got those two out, we can use Rubinia to take a 3/3, then "retake" it with Beguiler now that we have 3 creatures under control to maintain permanent control of it. Inventors' Fair is included because we have tons of artifacts, and it can help find any combo piece we're missing, or just an Ashnod's Altar if a sac outlet is needed. Trophy Mage is here for the same reason. Have plenty of ETB effects as a secondary theme too, and plenty of ways to flicker them. Venser, the Sojourner offers flicker, and can keep a similar control-your-creatures deck under control by flickering back a creature we own. Venser, Shaper Savant bounces one of our ETB creatures back for reuse, and Conjurer's Closet , Restoration Angel , Nephalia Smuggler , Deadeye Navigator , Mistmeadow Witch , and Roon of the Hidden Realm all offer more utility off of our ETB creatures. Any suggestions on what to add/cut is super appreciated! Trying to avoid individual cards over around $10 though.